I love the concept of family. I get warm fuzzies and I enjoy feeling a somewhat unconditional love. but when it comes time to go to vacation it is a bit different for me. Vacation is about relaxing, doing whatever the mood hits you to do when or if it hits you. You would be surprised by how different this is for everyone. 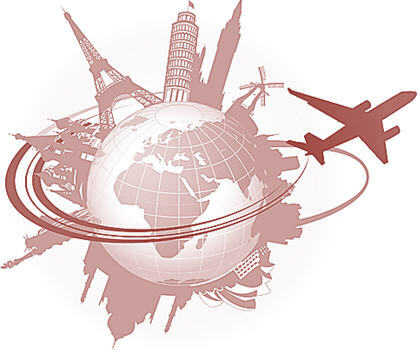 When traveling, some people must do everything that is in the brochure. Others, sleep as if they are trying to compete with Rip Van Winkle. Still there are some who try to do everything they don’t get to do during their week. I feel I am a combination of all these things. So its hard to find the ultimate travel companions. And this usually does not mean a single family member. Blah is a word we sometimes used to describe our emotional state. Its not necessarily sad, or even bad. People sometimes use the phrase “It is what it is” to describe the state of blah. 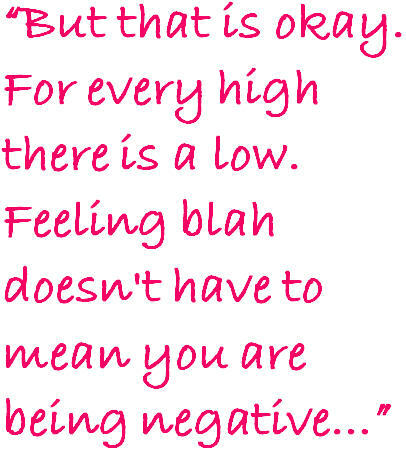 There are many ways we can feel blah. After we plan something big, such as a party, event or trip, we get so caught up in all the details but then when its over we feel lost or even a bit lonely. This can help us take a quick ride into the world of blah. Working on a project at work and being told it’s not great but it’s not bad after putting hours in it without direction can make you feel blah. Or getting not necessarily bad news in the grand scheme of things can trigger blah. For example, when I go to treatment and testing the good news is the cancer didn’t move. For me that is enough to have a party even though I’m sure some people think I’m nuts. Sometimes that same news can also just make me feel blah. Therapy for me is finding downtime to just sit in an old pair of sweatpants and watch reality tv, catch up on an book or even eat a buffet (which is me going to every restaurant I like, ordering take out and eating till I pass out). But that is okay. For every high there is a low. 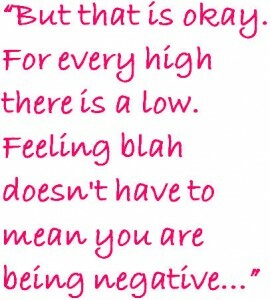 Feeling blah doesn’t have to mean you are being negative (sometimes referred to being a “debbie downer”). It just means you simply feel blah. Regardless of what is going on in your life there needs to be a balance. There is no rule that’s says you must walk on cloud nine every day. The only danger of the world of blah is when we try to out stay our welcome. Meaning we start sliding into a new world called depression. It is a very sneaky world because most of the time you don’t even realize you are there until its almost too late. Most of the time you do not jump into a state of depression, it sneaks up on you like tax season. That is when we should try to identify and evaluate how did blah take us to that point. Maybe desperate measures are needed such as prayer and devotional time, speaking to a therapist, a phone call to your best friend, starting a new exercise class, requesting that your boss let’s you take an class to learn something new, a mini vacation and the list goes on. As long as you accept that the occasional blahs are okay but making sure they are stay kept in check I think we will be okay. Have you ever actually been afraid to be alone with your thoughts for whatever reason? I sometimes get into this mood where I will do whatever it takes to distract myself to make sure that I won’t have a chance to have a clear head. My most common escape is work. I cannot begin to count how many times the word workaholic has been used to describe my behavior. Which is a lot easier to let someone believe than to just say I work because I’m afraid to let my mind wander. I also try charity work which is why working on the PinkforPam foundation has been beyond awesome. Sometimes, the most therapeutic solution in helping yourself is to help someone else. Regardless of what you do whether its reading a book, watching reality tv, and a list of probably a zillion other hobbies. You still at some point have to deal with your thoughts at some point. 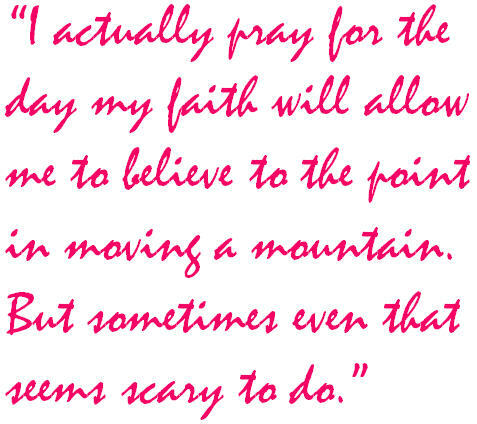 Prayer for me is powerful. 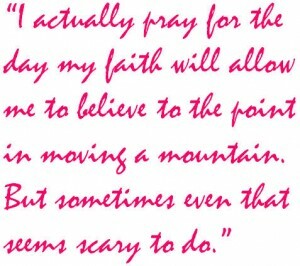 I actually pray for the day my faith will allow me to believe to the point in moving a mountain. But sometimes even that seems scary to do. And It begins with the fact that I don’t want to have to admit what’s in my head to myself. As always, I think the main thing to remember is that… It’s normal. And I personally know that even a tiny thought/prayer; “Help Me” has equal power as to a two hour concentrated prayer fest. Its definitely about quality and sincerity, than quantity. My most recent time of getting to this point, I ended up visiting a friend and I slowly just found myself talking about death and admitting to how I think about it more when things are going well rather than when things are going bad. It’s as if I will have to pay a price for the blessings and moments of happiness. It was if God put that person in front of me and gave me the okay that I could talk without freaking anyone out (this has happened before; I ended up having to cheer the other person up). Whatever thoughts you may have, just remember your not the first, and your not the last. Just don’t allow yourself to not become a slave to the negative ones. RULE #1: Stay hydrated. The majority of your body is water. It’s just science. In order for your immune system, among other things, to run properly, everyone should drink at least six to eight glasses of water a day. RULE #2: Eat fresh fruits and vegetables and reduce carb and sugar intake. By eating fresh foods you are reducing the number of chemicals and preservatives in your body. By reducing carbs and sugar intake you are allowing your body to not have to break down as many nutrients. RULE #3: Take a multi-vitamin. Everyone should take this anyways because it ensures your body is getting the vitamins it needs to run properly. Ensure you take one a day during the winter to help build your body’s immune system to fight infection. RULE #4: Don’t stress the small stuff. Stress can put your immune system at risk which causes your body to fight bacteria and viruses less effectively. Viral infections, arthritis and certain allergies can become worse based on your body’s stress level. Not to mention, those “stress headaches” and back and shoulder cramps from stress will add to the misery of being sick. RULE #5: Break a sweat. While exercising, your body produces antibodies which fight bacteria and viruses, thus making your body less susceptible to sickness. Also, by breaking a sweat, toxins escape the body and your metabolism increases. All in all, exercising is a win-win situation. RULE #6: Catch up on those Zzz. You cannot physically catch up on sleep, but you can increase the amount you get during the winter. Getting six to eight hours of sleep a night probably sounds impossible with our crazy lives, but to prevent sickness it can really make a difference. RULE #7: Keep your hands clean. The thought of all the germs on a hand makes me cringe. Wash your hands. Carry hand sanitizer. Be more self-conscious about what is touching your hands. In the long run, it can prevent the spreading of germs. RULE #8: Don’t smoke. Smoking damages the lungs which leads to breathing problems. It is very common for winter sickness to include coughing or throat irritation. By sucking in smoke, you are putting your lungs and everything along the way at risk. Either way, no one should smoke. It’s a terrible habit that leads to more problems than not. Stop drinking. I know this can be difficult, but you will heal quicker without alcohol in your system. When alcohol is in your system your body loses most of the vitamins and minerals which reduces the effectiveness of your immune system. Not to mention drinking dehydrates your body which is counterproductive to RULE #1. Eliminate eating dairy. Dairy has bacteria and if you are taking antibiotics, it’s counterproductive. Take Vitamin C and Zinc. Vitamin C and Zinc improve the immune system and help fight against bacteria and viruses. Try Airborne® or Emergen-C® to boost your Vitamin C intake and a Zinc supplement to help your body fight. Hydrate! Hydrate! Hydrate! I know we already discussed this, but in order for your body to recover, it needs to be at peak hydration. Reduce the amount of food that you eat. The less you eat the less time your body has to break down the food, which gives it more time to fight against infection. Sleep seven to eight hours at night. The more you sleep, the more down time the body has to fight against whatever is cycling through your body. Either way you slice it, there is always something that someone can do to help their body fight infection. As long as you see your primary physician when you start to get sick and you don’t let the bacteria and/or virus fester in your body for too long, getting over a winter sickness can go smoothly. I know that this year when my inevitable sickness comes knocking at my door, I know that I did my best to prevent it. I also know that I’ll be running implementing the six additional tips to get over my sickness as quickly as possible. Will you?